If you have bad credit and need a vehicle, you might be eligible for a bad credit car loan – but you also need to beware. While there are legitimate car loans for people with bad credit available, not all lenders are the same. You need to watch for red flags, inflated prices, and more. This can be as simple as bad terms, or as complicated as charging too much in fees. In this scenario, a dealership or lender tries to get you to buy a car when you walk on the lot, before your financing is approved. You might settle on a monthly payment of $250, and then get a call from them a week later saying that you’ll need to pay $350 per month. Avoid this by looking for language in the contract that says your loan is subject to approval. You shouldn’t be able to take a car off the lot until the dealer knows for sure that you can pay. Approval is never guaranteed, so any dealer promising this is lying and trying to get you off the lot with a car – similar to the yo-yo financing. Upfront fees are almost always a bad sign when it comes to car loans. (Note: this is different from a down payment.) If a dealer wants you to pay a fee before they determine if you’re even eligible for the loan, run – don’t walk – away. Some dealers try to add in extra costs without you realizing it by saying to focus on the monthly payment, not the total price. So, you might be purchasing an $6,000 car and repaying the loan over two years, which would be a monthly payment of $250 per month, but the dealer is charging you an extra $10 or $20 per month that you don’t know what it’s for. Solution: stay focused on the total price and ask about any additional costs. This scam targets those who can’t make their car payments. A secondary party may then charge you to negotiate with the lender for a small upfront fee. These companies rarely, if ever, actually negotiate with the lender. The solution: if you can’t make your payments, contact the lender directly. Better yet, make sure when you’re arranging your financing that you won’t run into this problem. Lowering the value of your trade-in. Telling you that your credit score is lower than it actually is. Avoid loans offered over 72 or 84 months. New car dealers often use longer repayment terms to make more money off you in interest payments. If you have bad credit and need a car, arrange your financing first, and then work with the lender to find a vehicle that makes sense for your budget. Don’t go to the dealer, fall in love with a car you can’t afford, and then agree to terms that ultimately harm you. At Prudent Value Cars, you can trust you’re working with a team who have your best interests at heart. 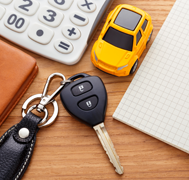 We’ll help you secure bad credit car loan financing and find a car that fits your budget. Contact us today. Call 1-888-852-7647 or visit www.prudentvaluecars.com.